The ULTIMATE portable PA system. Light, loud, long battery life, and weatherproof. Half the size and weight of popular commercial-grade systems (click for comparison). Up to eight hour full power operation from internal battery. No fragile injection-molded construction, underpowered amplifiers, or heavy lead-acid batteries – the DragonFly redefines what’s possible in a compact all-in-one PA. The DragonFly gives you the best possible audio in a compact and reliable design that serve for years. Fully weatherproof, the DragonFly can easily be transported and set up by one person. A molded in stand-mount socket on the bottom of the unit and inserts on the sides for yoke mounting give the DragonFly a range of deployment options. NEW: switchable ducking circuit automatically turns down music when wireless or wired mic is used . Integrated smart charger for battery pack – charge and run from 110-240 V AC power, 12-24 V CD power. Audio specifications based on ALMA EIA 426B test protocols. 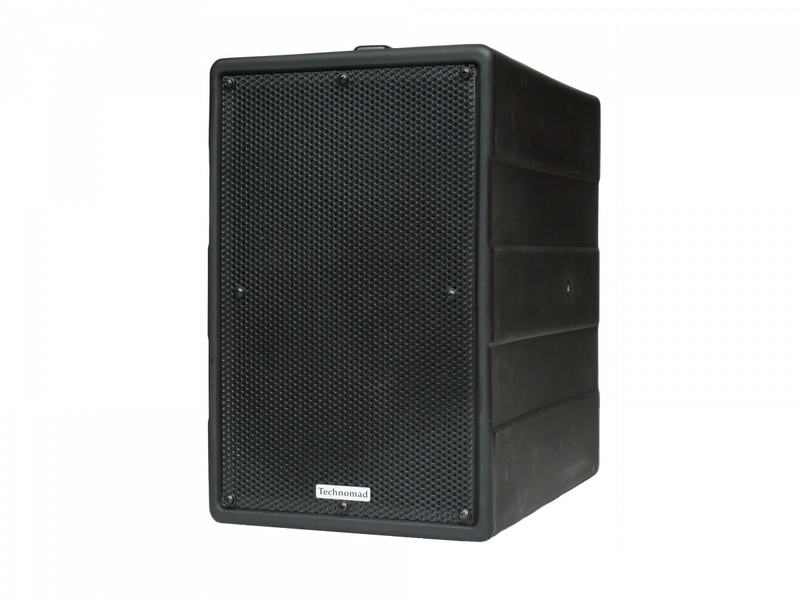 Expansion Speaker – double your output!